Aviva Drescher should stand on street corners with a cardboard sign reading, “WILL BULLY FOR ATTENTION”. Seriously, have you ever seen someone so relentlessly demanding of pity and attention as Aviva Drescher of Real Housewives of New York City?? She’s like some kind of deranged neediness-bully. First of all, she and her father are lucky Ramona only had George escorted out of the event – if someone grabbed me like that, under those circumstances (the pre-existing hard feelings, his virtually stalking Ramona and continually insisting she apologize to Aviva while refusing to listen to Ramona’s side, and the fact that the event was for ABUSED WOMEN), I would either slap or punch him – and then I’d consider pressing charges. How dare he, and how dare Aviva put themselves forth as victims?? Oh wait…I forgot for a second…Diva Aviva is always claiming victimization by Ramonja, relentlessly demands apologies and when she doesn’t get what she wants, she bullies. Now we know where she learned that behavior…. For a while I thought Aviva was the token crazy person now that kooky Kelly is gone (come ON, none of you bought Aviva’s facade of awesomeness the first few episodes, did you??). Leave it to the diva, she soon proved me wrong…she is a combination of Kelly and Jill – crazy and mean. But she’s worse than the two of them put together – she is like a pitbull when she doesn’t get sympathy or rapturous attention whenever she thinks she deserves it. Don’t get me wrong, I have loads of sympathy and empathy for anyone with anxiety disorders, but there comes a point where you have to make sure it doesn’t become other people’s problem. I have PTSD, so I really do get it. But I don’t make it other people’s problem, and here’s where Aviva crosses a big, fat, honkin’ line – she not only makes her anxiety disorders everyone else’s problem, but she DEMANDS that they accept the HONOR of partaking in her disorder, and DEMANDS that they pity her and be her cheerleader any time she does something she’s afraid of! Diva Aviva threw a fit when Ramonja didn’t get on their knees and worship her while simultaneously throwing a party (including fireworks on the beach) in her honor upon her arrival on vacation. She acted as if they’d victimized her by not doing that! So then she commenced with the incessant, demanding, odious, neediness, each time becoming more vicious in her insults, judgments and degrading remarks to both Ramona and Sonja. Diva Aviva is fond of using the word “appalling” when referring to Ramona…no surprise there, because Aviva wrote the book on being appalling. Degrading, offensive, inappropriate and ridiculous insults roll off Aviva’s tongue as quickly and efficiently as bad milk. She goes SO low into the high school mean-girl scum pond with her behavior. It was hilarious that at the beginning of tonight’s finale they showed a clip of her saying “let’s not become mean girls!” at the beginning of the season. But lest you think I’ve forgotten about her leg…of course I have sympathy and empathy for Aviva about her leg – I feel terrible for her loss of her foot and lower leg. I’m not just whistling in the wind, I know it’s traumatizing and causes a lot of problems in one’s life…I took care of my husband for years and he was an amputee. Why did I have to “take care of” him as an amputee? Because he also had brain damage. 2. Aviva is wealthy. My husband was poor. 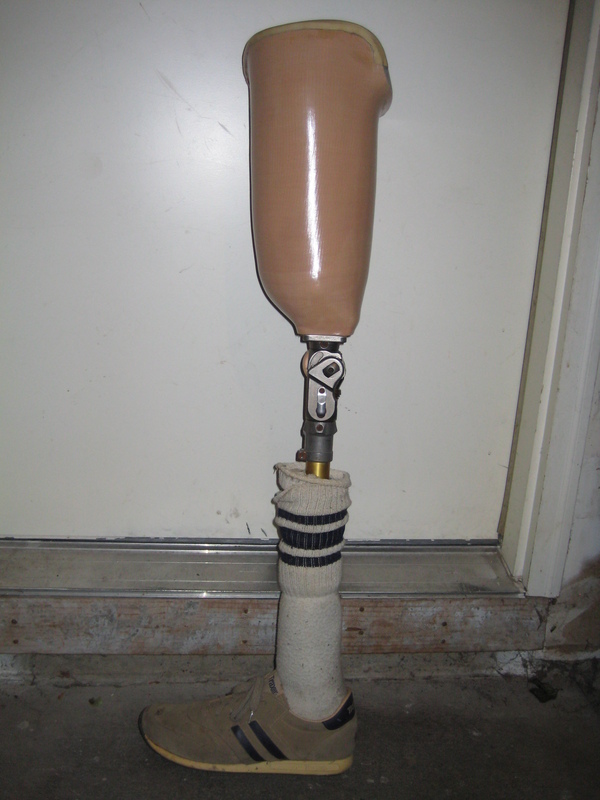 Here is a picture of one of Aviva’s prostheses. Here is another picture, where she’s wearing one (she has at least two). She even gets pedicures on the toenails of her prostheses, because they’re so artfully crafted and realistic looking. 3. Aviva is alive and otherwise healthy, and has a happy family life. Why is my husband’s prosthesis standing all alone there, on the dirty concrete step, against the garage door? Because he’s dead and doesn’t need it anymore. But that was a “good” prosthetic leg. A bit of a difference between the prostheses, no? Honestly, Diva Aviva, get some perspective – you have it pretty darned good in life, all things considered. It is time for you to STFU with your constant complaining, attacks and demands for attention. Or you could compromise – whine and demand attention ONCE. But then you have to STFU if you don’t get it. You can run off and cry in the bathroom or something, just stop inflicting your vindictive neediness onto everyone else. Am I the only one wondering whether Bethenny was being evil to us viewers for recommending Aviva for the show, or (more likely) was it another brilliant business and marketing idea to put that hot mess on the show?? How hard is she laughing when she watches these episodes? The only reason I’ll be able to stomach the reunion show is because I dig me some Andy Cohen in a really big way…. I also love me some Sonja, but I have a little shoutout to our favorite party girl: I LOVED you flat-out telling Diva Aviva that you just don’t care about her feelings on the matter, and refusing to apologize (for whatever imaginary slight…or was it for being naked and having fun? I never quite got that). But I kinda think you should rethink that…Maybe you should participate because, you know, Sonja in the City might be able to start billing Diva Aviva for some of those pity-parties! One last thing…. DAMN, Heather’s husband is hot! Really handsome, and he seems sensitive and thoughtful (seeing as how he was rationally trying to calm people down). Obviously, this means I hope Heather comes back next season. Well, that and I like that she’s up-front and doesn’t mind confrontation…like, AT ALL. As long as it’s a sane conversation, that is. She can hold her own, and I kinda want to see her in big fights with everyone because…*shudder*…she stays rational and omg, that is such an alien approach on that show!